Well, neighbors, I know you're all busy with that copy of the budget you downloaded and are using that fine-toothed comb to cull through every single line item to find more "fat" to cut. Yeah, right! Myself, I'm taking a little break from all that tedious number stuff - I trust the Finance staff to do their jobs with the numbers and the remainder of the city management team to do what they've been doing for many months - using all their skills to approach this budget year conservatively, always looking for ways to save. WILL THE COUNCIL DO IT'S HOMEWORK? Next Tuesday we'll find out if our city council has done their part and spent time on the budget document. Or, as has many times been the case, have they decided to take the easy, lazy way out and simply instruct the staff to take out their cleavers and make across the board chops in the headcount. I know from personal experience over many years wrestling with budgets that it can be an exhausting experience. I'm sure some on the council dais will have a lot of difficulty with this process, especially this year, because they're working with such intellectual limitations. So, to get you through the weekend, I have a couple little items for you to read. The first is an entry I wrote on this blog, in it's earlier iteration, just about this time of the year three years ago. Click HERE and you'll be taken to an archived blog page. Scroll down to the second entry dated June 21, 2006 and titled "Budgets and Boneheads". This will give you a little historical (hysterical?) perspective on this process from the recent past. Second, click HERE and you'll be taken to a very nice biographical profile of his ex-ness himself, former Costa Mesa Mayor and current Orange County Transportation Authority Chairman, Peter Buffa. Debbie Sklar at PublicCEO.com has, once again, provided a very nice profile of a Costa Mesa mover and shaker. 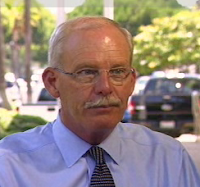 You may recall her recent profile of City Manager Allan Roeder which I linked for you HERE. This profile of Buffa gives you real insight to his skills and experience. If your only reference for him is his weekly Sunday morning column in the Daily Pilot, then you would have no idea the depth and breadth of his experience in Orange County politics. Even though I occasionally disagree with him on some issues - the ill-conceived and now defunct CenterLine Light Rail boondoggle, for example - I admire and respect Peter's ability and his foresight. I think you'll really enjoy this profile. ENJOY YOUR WEEKEND - GO LAKERS! That's it for now, folks. I'll be away from my computer for the weekend, so any comments will probably just sit in the hopper, waiting for me to retrieve and approve them for publication later. In the words of Peter Buffa, I gotta go. Well, neighbors, the proposed 2009/2010 budget is posted on the city web site (HERE). I suspect many of you will rush to download all 305 pages so you can go through it line by line. Only kidding... but I did download it and have made one fast pass through it. Yikes! It will be available for review at the Costa Mesa libraries and at City Hall the end of this week. I'm not going to try to cover everything in this budget, but this chart - borrowed from the budget - shows an overview of the proposal - a reduction of more than 18% from the previous year. There are some assumptions on which this budget proposal was based, the largest of which is the assumption that the labor organizations will agree to a 5% reduction in salaries and a significant reduction in overtime costs. At the time the budget proposal was published those negotiations were in progress. If they fail, then even greater cuts must be made to balance the budget. It is truly ironic that, on the very night that City Manager Allan Roeder presented the City Council with the budget proposal they rejected some new revenue sources proposed by the Fire Department totaling over $1 million. So, before the budget proposal even hit their hands they'd made it just that much more difficult to come up with a balanced budget! Talk about short-sighted! * Close Downtown Recreation Center pool from October to April. * Elimination of funding for planting of 250 trees, park and open space clean up crew, weekly median hardscape maintenance, fertilization of median landscape and turf. This will further reduce emergency tree response and removal. * Reduction of traffic enforcement & accident investigations; possible decreased response times related to Traffic Operations. * Reduction of small tool, materials and equipment repair related to graffiti removal. * Loss of Cold Case Detective; Likely increased workload to Street Crimes Unit. * Suspension of Police Department Recruitment Program. * Significant reduction in funding for Water Quality including consulting assistance and termination of catch basin entrance lid and screen repair/replacement program. The combination of these actions along with the reduced level of inspections to be completed on an annual basis and will have the potential to put the City out of compliance with the NPDES permit. * Eliminate most weekend & after business hour video production programs - not including cable casting of City council meetings. * Partial reallocation of Engineering employees salaries, from the General Fund to the Measure M Fund, will reduce the Measure M fund balance available for construction of street improvements and therefore a fewer number of streets will receive improvements. * Elimination of paving 2 residential streets, and reduction of approximately 750 tons of asphalt. * Reduction in the traffic signal maintenance account will impact the City's ability to respond to knockdowns and unexpected repair items. * Reduction of right of way weed control by 10%, resulting in more visible weeds along City streets, alleys and sidewalks. Decrease alley and right of way maintenance funding by 50%, possibly resulting in citizen complaints due to weeds and debris in alleys and in un-landscaped areas. * Elimination of all turf and landscape fertilization resulting in a decline in aesthetic quality of parks and landscape and reduce turf healing ability in high traffic areas. This also includes a reduction in the contract maintenance of TeWinkle Lake, elimination of the provision of the "Mutt Mitts" in all City parks and routine replacement of park furniture and related amenities. * Virtual elimination of all building repairs and major maintenance items such as termite fumigation, painting, plumbing & electrical repair and related property upkeep. * Postponement of most scheduled vehicle and equipment replacement except for police patrol vehicles. * Postponement of needed computer hardware & software replacement. * Elimination of all non-mandatory training and professional development for all personnel. * Reductions in Youth & Family programs, Mobile Recreation program, Youth Basketball and Football, Concerts in the Parks and suspension of Youth in government and reduced funding for the Cultural Arts and Historic Preservation Committees. * Reduction of turf mowing to two (2) times a month in all parks and City buildings except for sports fields which will remain weekly - resulting in a decline in aesthetic quality of parks and overgrown appearance. * Reduction in hours of the assigned part time staff overseeing contracts with Fairview Park users groups, OC Model Engineers and Harbor Soaring Society. Reduction in assistance given to Parks Project Manager regarding construction projects, performing research and writing council and Park Commission reports. Reduction in oversight of the Phase 1, 17-acre Riparian Habitat 5 year maintenance and monitoring as required by the Department of Fish and Game and US Wildlife Service. Phase 1 completed in June 2009. POOP MITTS VS. RECREATION LEADER? As you can see, there are many programs affected that will create some very significant lifestyle changes for many residents. There's already a fledgling grassroots effort to "save" the Mutt Mitts! Good grief! "If substantially approved as submitted and consistent with the 10 point Management Budget Strategy, the City will lose over 100,000 man hours over the course of the fiscal year. The proposed staffing levels reflect those of almost 25 years ago while serving a larger population today. This cannot happen without impacting the quality and quantity of service to the public. It would be illusory to suggest otherwise and disingenuous to the public we serve. At the same time, it is allowing Costa mesa to keep local taxes among the lowest of any City in Orange County and among the most business friendly cities anywhere in California. The future success of the community will rest with a well reasoned balance between the need for services and the desire for public amenities in combination with fiscal restraint and an equitable tax structure for all." Tuesday, June 9 - City Council Budget Study Session - Conference Room 1A, City Hall, 4:30 p.m.
Tuesday, June 9 - Tentatively scheduled adjourned Council Meeting following the study session. This will permit the council to provide direction as necessary to the staff. Tuesday, June 16 - Budget approval by City Council at their regularly scheduled meeting. 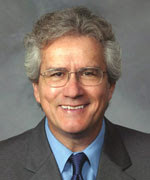 July 1, 2009 - The deadline for a balanced budget to be approved by the City Council. LET YOUR VOICE BE HEARD - OR SHUT UP LATER! Now is the time to contact your council members to let them know how you feel about this budget and give them your suggestions for improvements and other potential cuts. If you don't speak up now then hold your peace later when these budget cuts personally affect you - you had your chance to be heard. Once again the Costa Mesa City Council made for interesting viewing last night. City Manager Allan Roeder provided a confirmation of the budget schedule. He placed the budget into the council's hands at the end of the meeting. It will be available for review on the city web site by the end of the day today and in libraries and at City Hall for resident review by the end of the week. There will be a council study session at 4:30 on Tuesday, June 9th in Conference Room 1A, City Hall, at which time public comments will be gathered and the council will have a chance to be briefed on the budget. Roeder then told them that he will schedule an "adjourned" council meeting immediately thereafter so the council will have a method of giving the staff direction on the budget. Direction may not be provided during a study session. There will be a public budget workshop on Thursday, June 11, but the time and venue have not been firmed up. In years past it was conducted in Conference Room 1A at City Hall. Once again the proposals by the Fire Department for new revenue sources received rough treatment by some of the council members. Our young jailer (is he still a jailer? )/mayor, Allan Mansoor, demonstrated that he's more than willing to let the fiscal well-being of our city and residents take a back seat to his own personal political dogma. During the discussion of the EMS fees Mansoor demonstrated, once again, that he's about half-a-brain short! He seems perpetually unable to follow even the most slightly complex issue. To the cheers of many residents, Eric Bever brought the EMS fee issue back to the council for re-consideration. After a lengthy discussion and input from many residents the council voted unanimously to overturn their last vote and reject the EMS fee plan. This means the city will now have to find ways to cut around $900,000 from the budget... We'll see how long Bever's halo continues to shine after the budget is finally approved. Near the end of the meeting Roeder presented a resolution opposing the sale of the Orange County Fair and Exposition Center property - something the governor has suggested, along with many other state properties, to balance the state budget. The Fairgrounds generates more than $185 million in revenue each year. At the end of the meeting, just before 10 p.m., Roeder presented the proposed budget - significantly, in a plain, white cover this year - to the council and encouraged them to take their copies with them. Keep in mind that, with the actions the council took tonight declining the proposals of the Fire Department for additional revenue sources, they effectively removed about $1.25 million from the budget. That means more cuts to balance the budget. I've been writing about this for months because I've spent a good deal of time talking with members of the Finance Department staff and others so I have had a pretty good idea of just how deep a hole our city is in. But don't believe me. Let me quote City Manager Allan R oeder as he closed his presentation of the budget to the council tonight. First he told them, "... we are going to have to make some decisions..." implying that they will be hard decisions. Roeder went on to say, "If you took all the property taxes this city collects it's less than half what it takes to fund just the police and fire. If we did nothing else in this city - no streets, no parks, no open space, no recreation - property tax alone would be less than half of what's required for police and fire alone. If you took all of your property tax and all of your sales tax it just barely covers those two departments. And those are the departments you task to protect people, to provide the very important emergency medical services we talked about this evening so those are not areas, I would submit to you, ah, that are good candidates for cutting back on what we just heard this evening are essential services." Are you paying attention? I hope those statements got your attention, because that's what our elected leaders and the staff will be dealing with over the next two weeks. Roeder's not kidding around with this stuff. There will be no surgical trimming of the budget this year - it's meat cleaver time. During council member comments, in response to a question by Katrina Foley about how much has already been cut out of the budget, Roeder told the council that, "...the plan that we brought to you on April 14th, the one that you approved, slightly less than 90% of the $19 million plus that must be reduced to balance the budget is all cuts." He went on to describe the other 10%, roughly $1 million in additional funding - grants and the like - that will contribute to balancing the budget. Again, in response to a question by Foley, he affirmed that this is in addition to nearly $8 million in cuts made at the mid-year budget review. This council has demonstrated an unwillingness to consider new funding sources as presented to them. It has chosen not to put the Transient Occupancy Tax (TOT) and the Business License fees on the ballot for voters to consider for possible increases. It perpetuated the RRIP program last year when it was clear that the city was heading for rough water budget-wise. That program has cost the city coffers well over $1 million over the past three years. Neighbors, the next two weeks are probably going to be the bloodiest in recent memory. When the council votes for a new budget in two weeks there will be many, many unhappy people in our town. The employees will probably be the most unhappy because salaries and benefits are where we spend the bulk of our money - nearly 75% - so they are the logical places to look for cuts. Most residents have their own pet projects they don't want to see de-funded, but unless something magic happens over the next fortnight we will be seeing a much smaller city staff left to deal with our demands for services. It ain't going to be pretty. If you've got some great ideas for helping with the budget, get on the horn and call the city staff or a council member. Send them an email or letter or just hike over to City Hall and talk to someone. Attend the study session next Tuesday or the workshop on the 11th. Now's the time to donate your brain to this process because we obviously don't have enough grey matter on the dais to solve the problems. DON'T TIGHTEN THAT BELT, EAT IT! Some folks seem to think this year our city will be doing some serious belt-tightening. Actually, it's probably going to be more like boiling that belt so we'll have something to eat! Sunday, May 31st, the Orange County Register published another in a series of articles on education in Orange County. This time, in a group of articles written by Fermin Leal and Scott Martindale, it ranked 64 comprehensive diverse high schools from 15 school districts using a variety of measurements. I'm not going to try to paraphrase the article(s) but you can begin reading them HERE. To pique your interest I will tell you that, based on the rankings provided in this series, of the 15 school districts listed, the Newport-Mesa Unified School District ranked fourteenth, just ahead of Santa Ana. Only four high schools in Santa Ana finished lower than Costa Mesa High School, with Orange High School sandwiched between Estancia and Costa Mesa. The articles that can be found beginning at the link above provide the explanation of how these rankings were compiled and explain in great detail how various elements were weighted when calculating the rankings. I encourage you to go to that link and read through the articles. It will not surprise me at all if some in our community come completely unglued at these numbers. While I don't spend a lot of time dwelling on school district issues, I do pay attention. These numbers do not surprise me. The fact that Corona del Mar is ranked high and the other three high schools are ranked progressively lower the further they get from the Back Bay doesn't surprise me. I'm not happy about it, but I'm not surprised. You can read more about each of the schools rankings, including those schools not in this particular study HERE. I could not find anything that tells us why 30 schools, including Back Bay High, Orange Coast Middle College High and Early College High, were excluded from the study, but one must assume they didn't meet the definition of "comprehensive diverse high schools". I know some of you regular readers do spend a big part of your lives immersed in school district issues. I hope you will take the time to read the articles, then give me your opinions. I'll look forward to them. 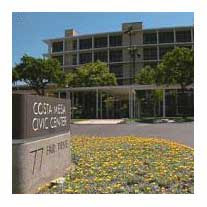 At their meeting on Tuesday, June 2nd, the Costa Mesa City Council will meet in closed session to discuss negotiations with the employee unions. Later that evening the staff will present to the council their proposed budget for Fiscal Year 2009/2010. On Tuesday, June 9th, the council will hold a study session to review the budget and, if history holds true, there will be a public workshop on the budget, probably on Thursday, June 11th. Final approval of the budget will likely occur at their meeting on June 16th. If there are problems the staff will still have a couple weeks to sort it out before the July 1st deadline. It wouldn't surprise me to see a special council meeting called in the last few days of the month. In recent years attendance at that public workshop has been sparse, to say the very least. By that I mean that there have been 3 of us there for the entire program, with a couple other people wandering through from time to time. It always amazes me how little interest there has been by the public when it comes to the budget even though every element of our municipal government depends on how those numbers are crunched. The Finance staff for the City of Costa Mesa has won awards year after year for the past three decades for their budget presentation. Typically, it provides information for every level of interest, beginning with a Budget-At-A-Glance booklet and progressing through a couple documents that provide greater detail and on to the actual budget itself for those nit-pickers and would-be budget analysts among us who actually try to devour the information line item by line item. Our city, and every other one in this state, is in big trouble budget-wise this year. Sales and Property taxes are down and the Governor is threatening to "borrow" 8% of our already-diminished property tax dollars to try to balance the state budget. Heck, the City of Vallejo even filed for bankruptcy so it could resolve the crushing burden of employee labor contracts. We here in Costa Mesa have managed to get by for the past few years by the creative use of what is known as the "fund balance" - applying left over dollars to the next budget. That pool of money is just about tapped out because it has been used to balance the current budget - to the tune of around $15 million. As a result it's very likely that, for our leaders to balance the new budget there, will be very wide and deep personnel cuts - that's where the money is, after all. Almost 75% of our municipal expenditures are for wages and benefits. I encourage anyone who is interested in the fiscal well-being of our city, and the budget process in particular, to attend the council study session on June 9th or, even better, the public workshop on June 11th. My personal experience at those workshops over the past few years has been totally positive - no question went unanswered . Typically they are conducted by Roeder, Marc Puckett, Bobby Young and others of the Finance Department staff. In years past members of the City Council have not attended the workshop. It's the time to get the real scoop on the budget and help dispel any myths you might have about where the money comes from and where it goes, and why. I'll see you at the workshop on June 11th, Conference Room 1A at City Hall. Bring your questions.